When you leave your body, you will be at home in My presence. and to be at home with the Lord. 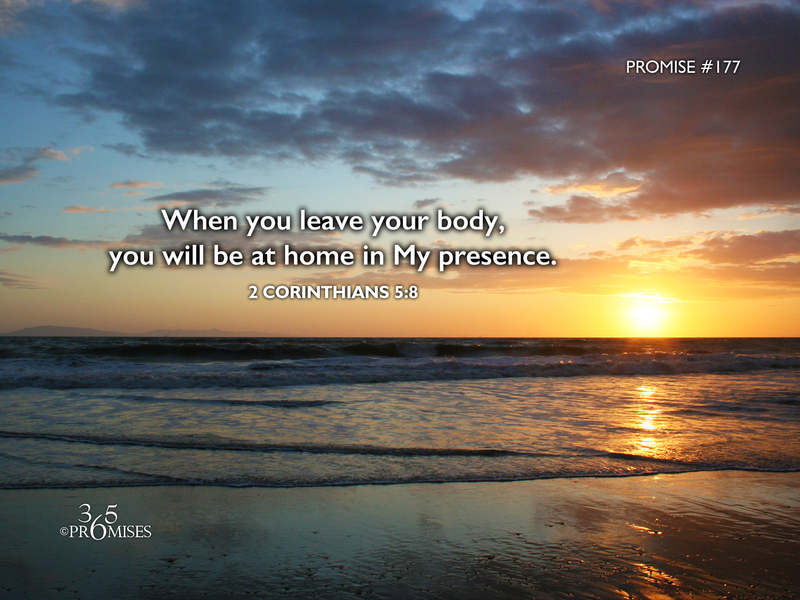 I am so glad that Paul the Apostle made this declaration that reveals a very special promise from God... To be absent from our body is to be present with the Lord! He promises to never leave us or forsake us in this world, and when it is time for us to leave this world, we are with Him forever! Hebrews 12:1 says that we are surrounded by a great cloud of witnesses that have gone before us that are cheering us on in our race. One day, we will be joined with Jesus, in eternal glory, and will echo the same cheers that the great cloud of witnesses voice today. Hallelujah that death has lost its sting! Nothing can ever separate us from the love of God in Jesus Christ. When we are absent from our body, we will be at home in our Papa God's presence. This promise is very comforting for me and the thought of my loved ones who have gone on to be with the Lord already. My prayer today is that everyone who reads this promise today will be comforted in knowing that all those who hope in Christ have this promise of eternal life.